Really, there's not much to setting up your bells, as you can see. You need a beam, and you need some way of attaching the bells to the beam. And you need enough space for your ringers to be able to control the bells comfortably. We do not recommend trying to ring the bells from far below it will be very hard to actually play your bells at that distance, although if you have a high tower, you could run a line might down to ground for ringing a simple Blagovest, the Hours, Creed, etc. (For more on how to ring, click here.) 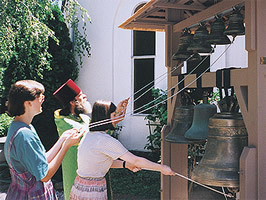 Orthodox-style bell ringing striking a zvon is rhythmic and improvisational, like playing drums. For this reason, the architectural assumptions used in mounting Orthodox bells differ from those for Western-style swinging or (God forbid!) electromechanically operated bells. Therefore, if you are planning to build a bell tower or zvonnitsa, please have your architects or designers get in touch with us first! There are special considerations for tower design, if you plan to strike your bells in the Orthodox manner! We will be happy to give you the wisdom of our experience, free of charge. And, if you are building something larger than the simple plans we show here, we can arrange professional, low-cost consulting with a member of the Campanic Arts Association of Russia, to make sure your tower is optimally designed for Orthodox bell ringing. Here is a portable zvonnitsa, suitable for temporary mounting of your bells. This is the smaller of the frames that we use for our traveling demo sets. 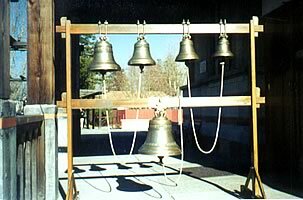 In this picture, the big bell weighs 120 lbs; a simple 2x4 is strong enough to hold it, and for limited times, it could bear the next smaller bell as well (here shown on the top row 70 lbs). However, 200 lbs is too heavy for long-term use of a 2x4 beam with a 200+ lb load, and that's especially true if all the weight is concentrated at one point only i.e., if the bell shown here were larger. The .pdf which you can download here shows a heavier frame, built of 4x4's. (We will have a picture of it here very soon, as well). This is an as-built drawing of the very sturdy frame that we use for our larger demo set. If the wood is clear and free of knots or cracks, the beam is likely to be safe for bells of up to at least 500 lbs. The same design can be used for heavier or lighter frames. On our demo model, the bolts are 5/8" in diameter. The two largest bells on the lower beam in the .pdf weigh approximately 350 and 220 lbs respectively. Considering that an average person weighs 150 to 175 lbs, you can judge whether a beam will support the bell(s) you propose to hang from it by observing how well the beam supports two or three people of that weight standing or even jumping on it. Keep in mind, though, that a bell is suspended from a beam at a much narrower point than is feasible with two or more people. Always choose lumber that is clear and free of knots, cracks, and splitting. Drill the holes with a drill press or other type of guide to ensure smooth fitting of hardware. Below is a picture of the mounting assembly that we used to mount the bells to the beam in any zvonnitsa. Of course, the width of the U-brackets will be determined by the width of the beam (2x4 or 4x4), but at any size they are standard items available at any large hardware store. This bracket assembly works just fine for the smaller bells. 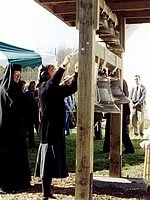 For larger bells, it may (or may not) be hard to find brackets that are long enough. But in any case, be sure that they can bear the load you intend to hang on them! It may be expedient to stack two cross-plates for extra strength. You can find this assembly at any large hardware store for a couple of bucks. We used 1/2-inch nylon rope to secure the larger bells both in the permanent zvonnitsa shown above and in the portable ones shown in this section. If you use rope, be sure that the load-test specs show that it is adequate. Use a knot appropriate to the material of which the rope is made. SQUARE KNOTS ARE VERY DANGEROUS WITH SYNTHETIC ROPES. DO NOT USE SQUARE KNOTS. A knot we have found to be effective is shown in the downloadable .pdf. Please be aware that the lip of a bell is somewhat sharp, for acoustic reasons. A falling bell could easily maim or even cut off a foot or other limb. Watch where you stand when mounting or dismounting a bell. Always use safe practices. Finally, protect your hearing! Use earplugs or industrial ear protectors. Hearing loss is gradual, and permanent. And permanent tinnitus (ringing in the ears) which can accompany hearing loss is unpleasant. If you must ring without using earplugs, keep your mouth open as this will relieve some of the pressure. But remember, in Russia they don't say "deaf as a bell-ringer" due to lack of experience! By all means please share your plans (and pictures!) with us as well! Other churches might find in your experience just the wisdom they need!